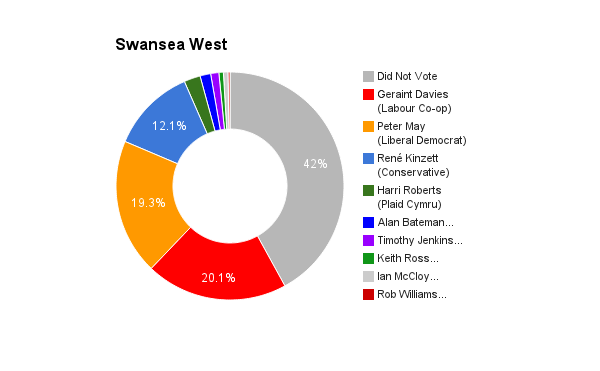 Swansea West is located in the south of Wales. It was created in 1918 and has been held by the Labour party since 1964. The current member of parliament is the Labour party’s Geraint Davies, who has served since 2010. I’m an education worker who’s been at the sharp end of Welsh Labour passing on Tory cuts in education. I’m a workplace shop steward and I’m fed up of trade unions giving £millions to a Labour Party that makes Tory cuts and always refuses to support us when we fight to defend jobs and services. 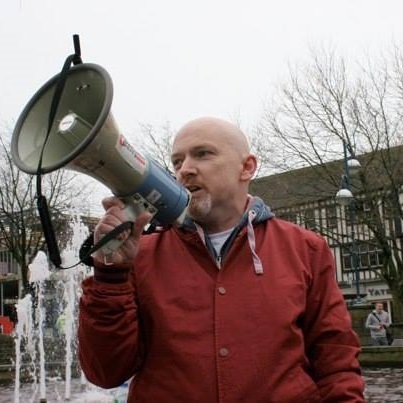 I’m the Secretary of Swansea Trades Council and, as a committed trade unionist, I think workers need our own party. The bosses have no end of parties, including Labour, committed to protecting their profits. I’m a socialist, a member of the Socialist Party – one of the constituent parts of TUSC, and I want to see society run in the interests of millions of working class people not for a handful of millionaires. The surest way to ensure that representatives remain in touch with the electorate is for them to live the same lives as the voters, experiencing the same everyday problems. This is why, I’m committed to the principle of being “a workers’ representative on a worker’s wage”. If elected, I pledge not to take a penny more than my current wage as an education worker. This would mean living on much less than half an MP’s salary and donating the rest back to trade unionists and campaigners fighting austerity. There’s nothing special about me; I’m just a trade unionist who says enough is enough. What makes me the best candidate for this constituency is the fact that I’m representing the Trades Unionist and Socialist Coalition. We’re the only party standing whose candidates are all committed to voting against and fighting against all cuts to jobs and services. Standing isn’t about building a political career for me or other TUSC candidates but about saying that working class people should not be made to pay for a crisis we didn’t cause. I’m sure Geraint Davies wants to represent people in Swansea but ultimately he’s constrained by the politics of his party, the Labour Party, and their commitment to the market and acceptance of austerity. The Labour Party has been unsuccessful and ineffectual in opposing Con-Dem austerity because, although they might disagree over details, they are part of the cuts-consensus. Geraint has supported the campaign to save my son’s school playing fields to his credit but his support has had no effect to-date on his Labour Party colleagues in Swansea Council who are proceeding with selling school playing fields to developers. Labour councils and the Labour Welsh Government have implemented austerity and will do so in Government in Parliament if they win the general election. Austerity is a screen to hide the enormous transfer of wealth from the majority in society to those at the very top under this government. The only people for whom austerity is working are the rich. For the majority of us it means hardship without end as, even in a supposed recovery, we see our real incomes continue to fall. Meanwhile the bonuses of the very bankers and financial speculators, whose greed and irresponsibility were a trigger for the financial crisis, have long surpassed the level they were before the crash. The first thing that has to be said about immigration is that immigrants didn’t cause the economic crisis and it is not immigrants who are slashing jobs and services. Immigrants can contribute to the economy and, due to the lack of investment in training, society is reliant on immigrants to fill skills gaps and whole services like the NHS, are dependent on immigrant workers. Bosses look to exploit immigrant workers to drive down wages and conditions. This we have to resist by fighting for the trade union rates of pay for the job regardless of the nationality of the workers employed. Perhaps the biggest factor in the decline of workers’ wages and in services for working class communities has been the shackling of our trade unions through some of the most restrictive trade union laws in the world. Restrictions on trade unions imposed by the Tories were left in place during 13 years of the last Labour government. TUSC wants to unshackle the trade unions to allow them to defend workers and working class communities. In addition TUSC is about offering a political alternative to austerity and demanding working class people no longer continue to pay for a crisis in the bosses’ system that we didn’t cause. The NHS has been the envy of ordinary people across the world but that position is threatened by encroaching privatisation and under-funding. It’s true that Wales has been spared the naked privatisation of the Health and Social Care Act but deep cuts in funding, passed on by the Labour Welsh Government, are devastating services here as well as in England. TUSC wants to restore the NHS to its founding principles of being free at the point of delivery, accessible to all and with all decisions being taken on the basis of clinical need and not cost. Privatisation must be reversed, PFI contracts which are bleeding the NHS dry, including all those introduced by the last Labour Government must be cancelled. I also think that the drug companies and other private suppliers, which are parasites on the NHS, should be brought under democratic public ownership. There is no shortage of work that needs doing in society. There is a housing shortage that needs to be tackled, schools and hospitals need to be built or refurbished, staffed and run. Investing in the services we all need, education, health, transport, etc could be a means to create quality jobs. In addition trade unions have produced detailed proposals on how tackling climate change could lead to the creation of jobs as well as improving our environment. If society was organised on the basis of need rather than profit then the working week could be reduced and the age of retirement reduced, to relieve the stress on working people and create additional jobs. There is a lack of diversity in race and gender in Parliament and also in class and political outlook. There is a political establishment that dominates Parliament, many of whom went to the same schools and colleges and who are far removed from ordinary peoples’ lives, our struggles and issues. So the majority of us are not represented which is a big part of why so many don’t vote. The Labour Party is no different to the others in this respect as demonstrated by the phenomenon of the ‘red princelings’ – the sons of Labour politicians who seem to think that a political career on the backs of working class people is their birth right. TUSC candidates don’t see representing our class as a career. I would call for a vote to reject the bosses’ EU. The EU has been a tool to drive down wages and conditions across Europe, undermining trade union-negotiated terms and conditions. It also undermines democracy, for example, making possible the secret negotiation of the Trans-Atlantic Trade and Investment Partnership (TTIP), which exposes public services to the threat of privatisation. However my opposition to the EU has nothing in common with the narrow nationalism of right wing Tories and of UKIP, I’m in favour of the maximum voluntary unity of working class people across Europe on a socialist and democratic basis.